At the company's Mobile World Congress in Barcelona, Spain, SanDisk announced today the imminent release of the single largest-capacity MicroSD card ever created. This tiny storage medium offers an unprecedented 128 GB of space, but don't expect it to come cheap. "Until now, consumers had to spread out their content between multiple products because the memory on those devices was not able to hold enough data in one place," explained Stuart Robinson, the director of Handset Component Technologies, Strategy Analytics, said in a press release. 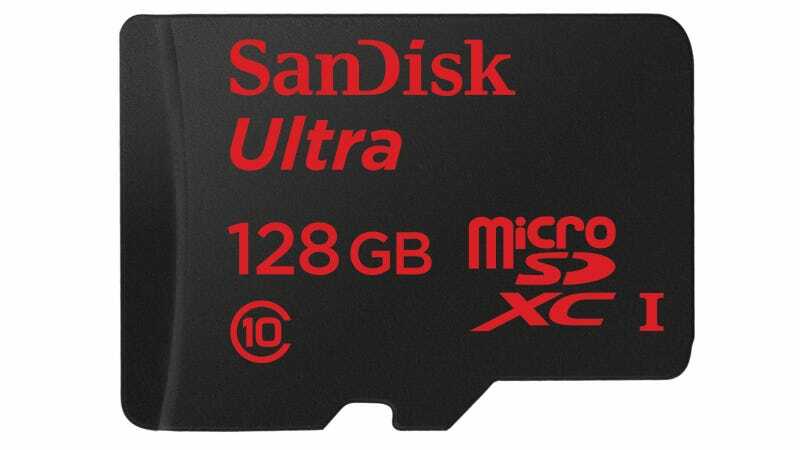 "This 128GB microSD card is going to be popular as the preferred removable storage option, giving users fast, secure and reliable access to their personal data archives." What's more, the new MicroSD card will include access to a new version of the SanDisk Memory Zone app which enables users to view, access, and backup locally stored files from a mobile device's internal storage, transferring them to the the new card. The new line of Ultra microSDXC cards will span from 8GB to 128GB and run between $30 and $200 when they go on sale tomorrow at BestBuy.com and Amazon.com.